Health Benefits of Lemon Water – Have you ever heard about lemon health benefits? 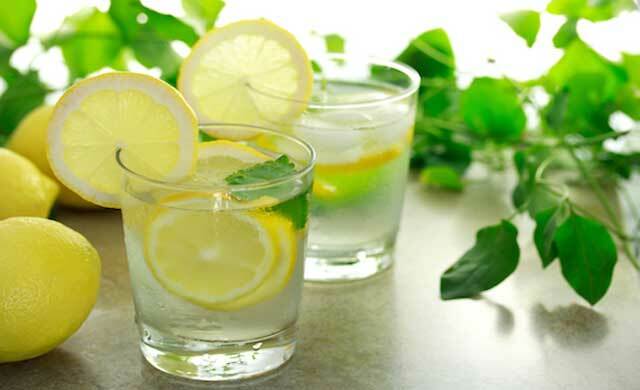 Experts say that drinking a glass of warm water in the morning that mix with lemon is magnificent for health. It is true, the following reasons. Water is an essential component in the body that can maintain health, and water can remove toxins in the body. Lemon is an important fruit for health and provides many nutrients that needed by the body. Lemon is a good source of calcium, potassium, magnesium, iron and vitamins A, C and B complex as well as pectin fiber, protein, and carbohydrates. Lemon including an excellent fruit to boost immunity. To get the maximum benefit of lemon water trying to squeeze half a lemon and mix with warm water in the morning. Then the concoction is drunk before you eat food or drink. After drinking a mixture of lemon wait 30 minutes, and then allowed to consume other foods. Lemon beneficial for digestion the body. Some components in the lemon are known stimulate the liver to produce more bile that needed for digestion. Lemon also helps release toxins in the body. Consuming a glass of warm water mixed with lemon can relieve health problems like bloating, belching, heartburn and other digestive disorders. Lemon water can also promote the smooth bowel so avoid the problem of constipation. The American Cancer Society recommends drinking lemon water to cancer patients to facilitate defecation. If you are trying to lose weight, then the lemon water is the solution. Drink a glass warm water mixed with lemon (also mixed with honey) every day can help you lose weight. Lemons contain pectin fiber that can suppress your appetite because you feel satiety. Combined lemon water and honey and warm water can make alkaline conditions in the stomach and lose weight quickly. Consuming warm lemon water each day to cleanse your skin. Wash the blood, stimulates the growth of new cells in the body. Lemon also contains vitamin C and other antioxidants that are beneficial for healthy skin, keep skin beautiful, eliminates free radicals, and remove wrinkles. Warm lemon water is also useful to boost immunity. The content of vitamin C in the lemon makes the fruit very active in attacking various diseases in the body such as the flu, and keeping the immune system remains stable. Not only that but lemons also helps the absorption of iron in the body. The acidic of lemon if combined with the properties of honey and water, this helps eliminate bad breath. It cleans the mouth and activates the production of saliva to kill bacteria that cause odor. Health benefits of lemon in maintaining the pH balance of the body. Lemon fruit is one of the best foods for alkalizing the body because lemon contains citric and ascorbic acid that can help to maintain the pH levels. A proper pH level is essential as too much acidity in the body can be inflammatory. Drinking lemon water with warm water every morning when the stomach was empty was very beneficial for health. Because this water will eliminate the acidity of your stomach including joint pain and gout as well as a variety of diseases that caused by inflammation. Antibacterial properties in the lemon help fight throat infections and other problems related to a throat. In fact, drinking a glass of warm water with lemon can help with asthma. Lemon mixed with hot water is also useful for cleaning the bladder. Lemon is a diuretic, and this drink can change the pH of urinary tract so that it can shrink the proliferation of harmful bacteria. In summary, to drink warm water mixed with lemon in the morning is exquisite for health. Drink for 30 minutes before taking another drink or eat. For maximum results, make this as your routine.